Alan Turing manuscript sells for $1m Jump to media player A scientific notebook compiled by World War Two codebreaker Alan Turing sells for $1m in New York. Working with Alan Turing Jump to media player Mike Woodger, who worked as an assistant to Alan Turing in 1946, recalls what it was like to work with the computing pioneer. Turing private notebook to be sold Jump to media player A 1942 notebook belonging to mathematical genius Alan Turing, who helped break the Nazi code, is to be sold at auction in New York this April. Turing 'created computer blueprint' Jump to media player Prof Barry Cooper and Baroness Trumpington discuss the posthumous royal pardon given to codebreaker Alan Turing. A scientific notebook compiled by World War Two codebreaker Alan Turing has sold for $1m in New York. The handwritten notes, dating from 1942 when he worked at Bletchley Park, were entrusted to mathematician Robin Gandy after Turing's death. 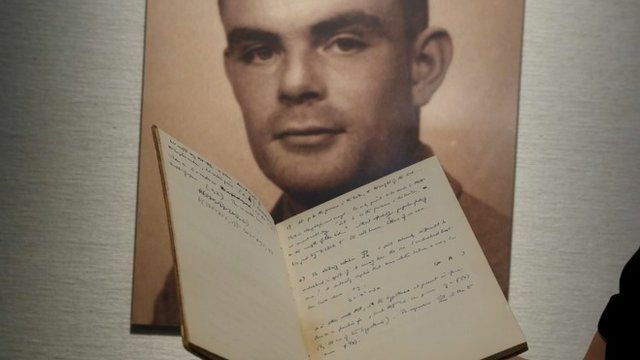 Cassandra Hatton, director of history of science and technology at Bonhams, said it was the only time that a handwritten document by Turing had ever sold in auction.